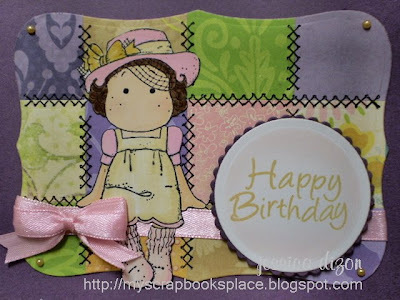 I just used scraps from the papers that I used on my previous cards. I used my square Nesties since I don't have a square punch. After adhering the die-cut square papers, I then cut it using Labels Eight then did some faux stitching to make it look more realistic. Since I have faux stitching here, I then made this one my 2nd entry for the MDUC#39 challenge. Tilda was coloured using Copics and Sugarloaf markers. 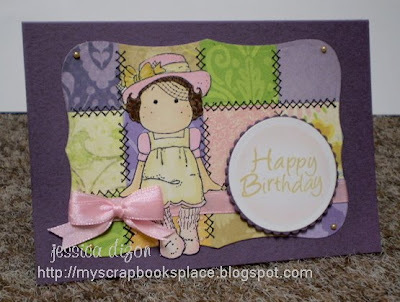 This card goes out to my niece for her birthday. I hope she likes it. This is so pretty!! I love the colors and the little girl! Your work is so nice!! I'm sure your niece will just adore this card!! Beautiful colouring and love the quilt effect behind! !